A group of mostly retired people meet for daytime visits, excursions and dining, with the fellowship greatly valued by all. 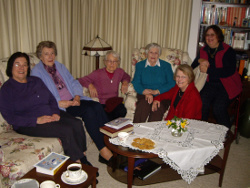 The group meet to share coffee/chat and then bible study and prayer/sharing. They discuss issues of faith and how it relates to daily life. The group do various needle, knitting and craft work, usually making items that are sold for worthy causes. The group meet once a month to go to the cinema and then have coffee afterwards. Good company, and usually a good movie. 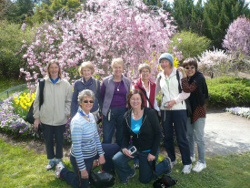 The group go walking each week around Lake Ginninderra. They walk at varied rates, usually taking around 90 minutes. Coffee afterwards is consumed in about the same length of time! Other walkers are always welcome. Adult singles and couples meet in one of the homes to share a meal, with each person or couple providing part of the meal. There are three meals a year, with people meeting and getting to know different people at each meal. This small group grew out of assisting the Office Manager with the weekly newsletter. It's become a very friendly and supportive group who gather for coffee, buns and a chat. A slow-paced style of yoga with poses that are held for betweem 3 and 5 minutes. It targets the connective tissues, particularly of the hips, pelvis, inner thighs and lower spine and aids circulation, flexibility and strength. The Yin Yoga teacher will also guide your breathing, encourage stillness and promote relaxation. Open to men as well as women. Wear loose, comfortable clothing. Bring a yoga mat and a couple of large towels or a soft blanket, to use as a prop. Cost: $5 per session.